ST. GEORGE – Cyclists and communities across the county will be observing National Bike Month with cycling-centric activities throughout May. 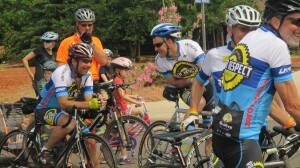 The following list of event was supplied via the Southern Utah Bicycling Alliance. Thursday, May 4: National Bike Month kicks off Wednesday with Walk/Bike to School Day. Children are encouraged to walk or ride their bikes to school Wednesday. This year, Little Valley Elementary has been selected by the City of St. George for a special bike-to-school program. Friday, May 6: The George Streetfest will be renamed “Iron George” this Friday in honor of the Ironman 70.3 competition taking place Saturday. Attendees are encouraged to ride their bikes to downtown St. George where Iron George will be held between 6-10 p.m.
A free secure bike valet sponsored by SUBA and the St. George Active Transportation Committee will be located mid-block between St. George Blvd and Tabernacle, just south of Zions Banks near the water features. The Tour of Utah will also have a booth nearby with free swag and details about the Stage 1 start of the Tour on Aug. 1 in Springdale. May 16-20: Bike to Work Week/Day – Leave the car at home and ride your bike to work. 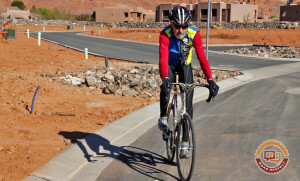 St. George Mayor Jon Pike participated in Bike to Work week last year and said he’ll do so again this year. The official Bike to Work takes place May 20, where cyclists can stop by the corner of St. George Boulevard and Main Street between 7-9:30 a.m. for treats, refreshments and some surprises. The Southwest Utah Public Health Department, Southern Utah Bicycle Alliance and the St. George Active Transportation Committee will be sponsoring an Energizer Station for everyone commuting by bike this day. May 21: Road Respect Returns to Washington County – Washington County will be the first officially designated “County Road Respect Community” in the state and we are celebrating that achievement at Enterprise Elementary School. The event is being hosted by the Washington County Sheriff’s Department and will include free kid’s bike helmets, kid’s bike skills rodeo and other fun activities. There will also be a drawing for a free bike compliments of eSpokes. Multiple cities in Washington County have been designated Road Respect Communities in recent years including St. George, Santa Clara, Hurricane, Washington City, Ivins, and others.